(Newser) – A private search party is looking for a missing pregnant Hawaii woman whose SUV was found torched two days earlier in a rural area. Carly Scott's mother reported her missing Monday. She told police a family member last saw the 27-year-old redhead Sunday night at her sister's home in Haiku, in northeast Maui. 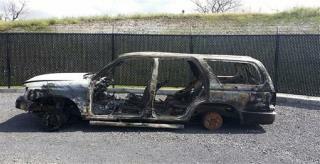 The Makawao woman's burned 1997 Toyota 4Runner was found Wednesday in Haiku's Peahi area. Before the vehicle was located, police found Scott's dog in the nearby community of Nahiku, the Maui News reported. Searchers have also found her shirt and skirt, a friend tells the paper. You can't Pass or Fail a lie-detector test, It's just an Intimidation Tool and a Scam.